1 A.D.A.M Medical Encyclopedia, US National Library of Medicine. PubMed Health. http://www.ncbi.nlm.nih.gov/pubmedhealth/PMH0002150/ Retrieved June 1, 2012. 2 Waisbren SE, Doherty LB, Baily IV, et al. 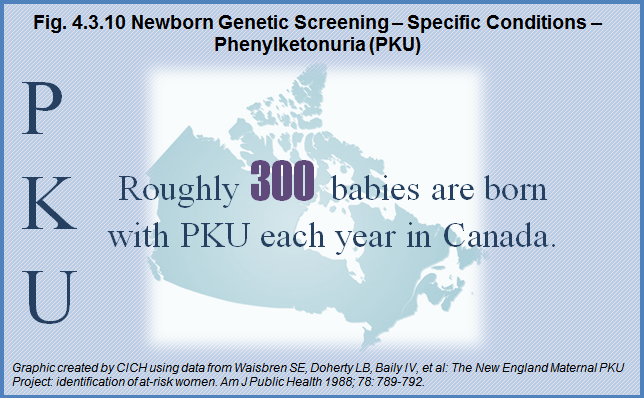 The New England Maternal PKU Project: identification of at-risk women. Am J Public Health. 1988;78:789–92. Brain damage and developmental delay can only be prevented when babies are diagnosed with PKU early – that is, as soon as possible after birth, generally between 7 and 10 days – and treatment is started immediately. The most effective treatment is a special diet very low in the amino acid phenylalanine, which must be followed throughout life. Infants and children on the PKU diet require special infant formula and specialty low protein products. Other treatment options, which involve special drugs that lower phenylalanine levels, are being researched and could potentially improve quality of life for people with PKU. When young women with PKU reach their reproductive years, it is essential that they are aware of their diagnosis. They must follow a strict diet before and during pregnancy to ensure that their baby is healthy.